After visiting the Mediterranean twice this past year, I’ve come to embrace the ubiquity that is the evil eye symbol and have since integrated it into the jewelry repertoire. Today I’ll be showing you how to make a sliding knot bracelet with an evil eye charm, which is thought to protect against negative energy and evil powers. 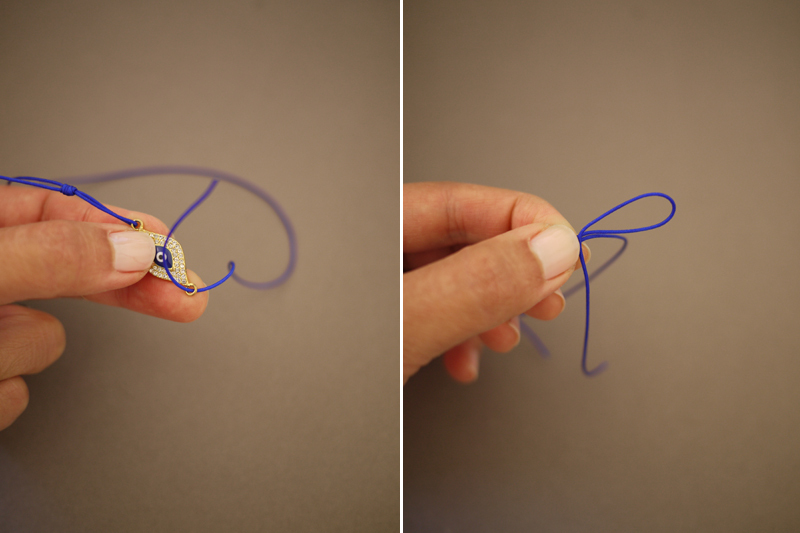 And whether you’re superstitious or not, this is a super simple method which can be applied to any connector or charm! Thread 4 inches of cord through one side of the charm. 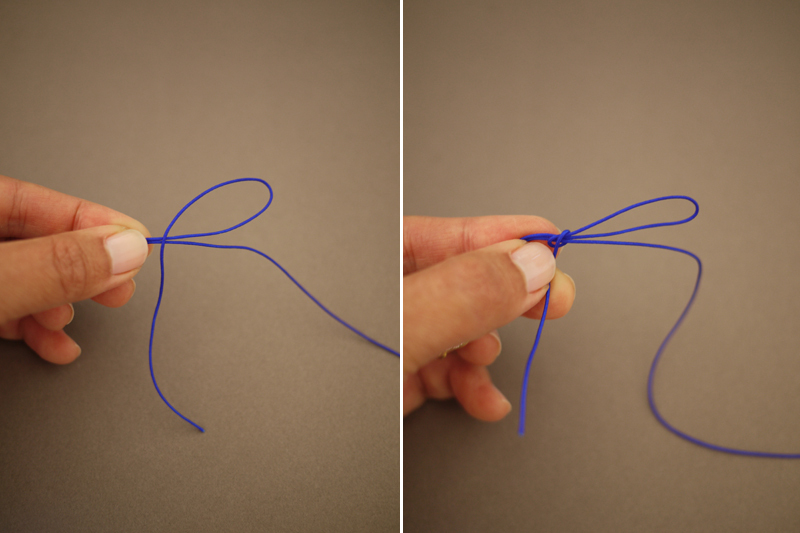 Fold 2 inches of cord back on itself and then again to create a zig zag. Fold an inch of the tip down over the parallel cords. Coil the cord three times towards the loop. Thread the tip through the opening of the left loop. 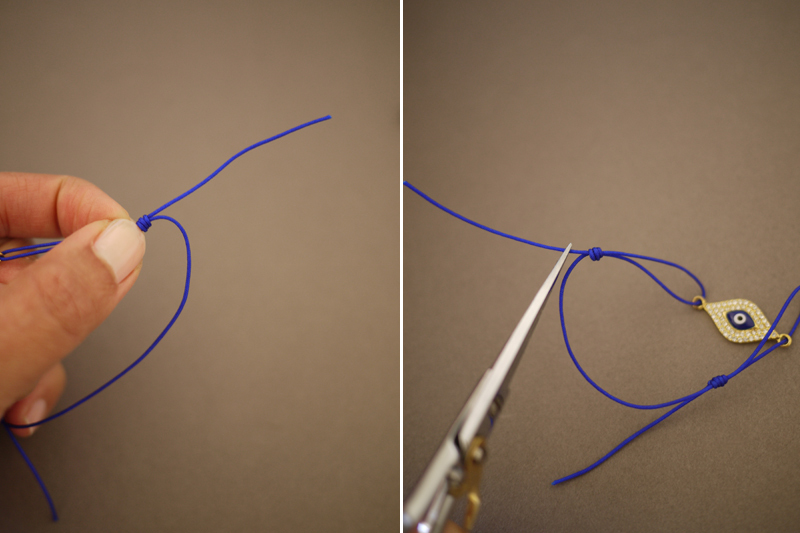 Push the coil to the right and pull the tip until the knot is tight. 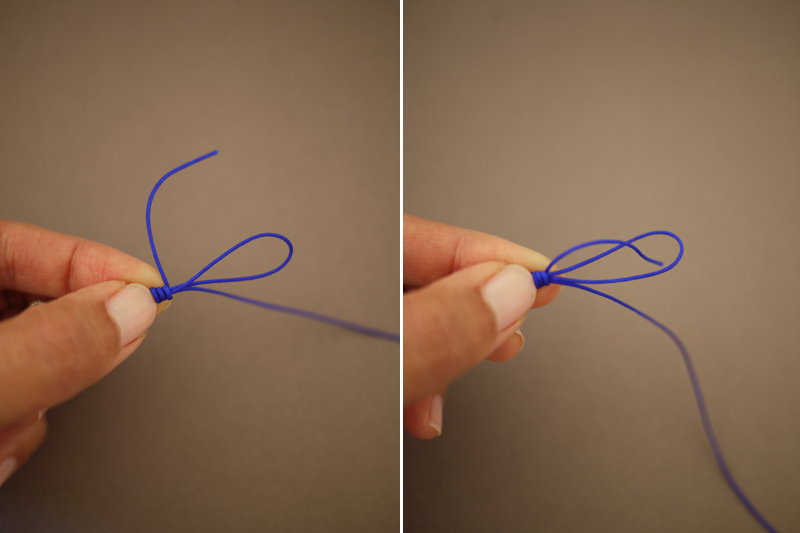 Test the adjustable knot by sliding it towards the base of the charm. The excess cord will be trimmed later. 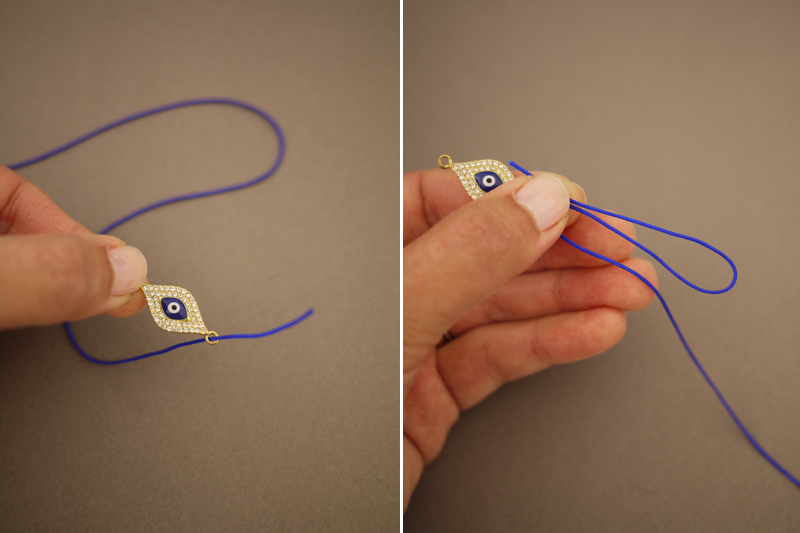 Thread the other end of the cord through the opposite side of the charm and create the same zig zag. Coil the tip around all the cords three times and thread the tip through the loop. 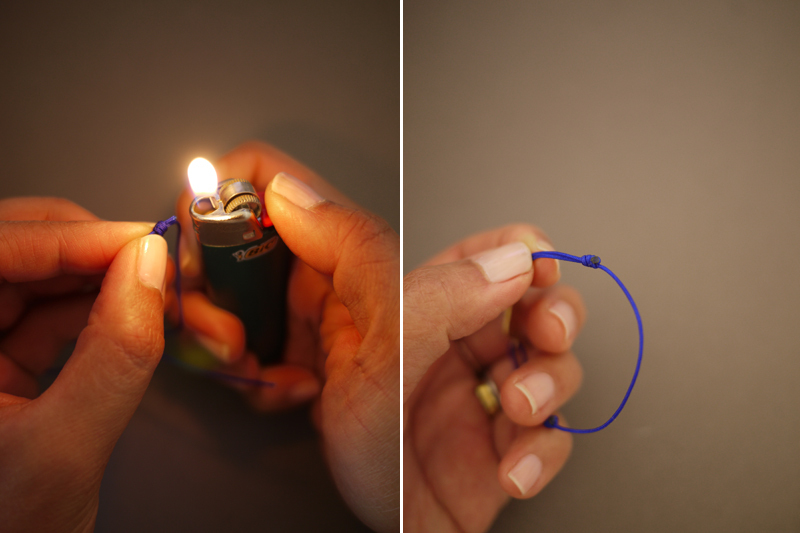 Push the coil to the right and pull the tip until the knot is tight. Trim both ends, leaving approximately 2-3mm. Melt the ends with a lighter. Your bracelet is finished . 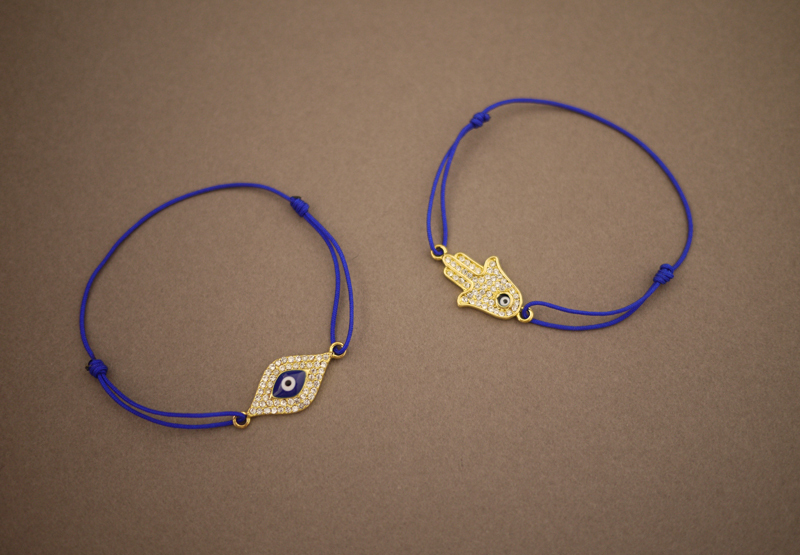 . .
And you’re now protected against the evil eye! Always helpful and creative ideas! OMG they’re so cool! I have to try….but it will be difficult to find these charms here where I live 🙁 Great idea and tutorial! beautiful!! I love how they turned out! OMG LOVE IT!!! I’ll try!! Love the bracelets!!! The color is also amazing!!! Excellent! Just like the ones they sell at the bazaar! 😉 Seriously though, blue eye beads are my main superstition, I truly believe you should always have one on you – keychain is the easiest way, but if it’s a special occasion and you’re not carrying your keys you should pin one to the inside of your clothes or something. And yes, I really do that. 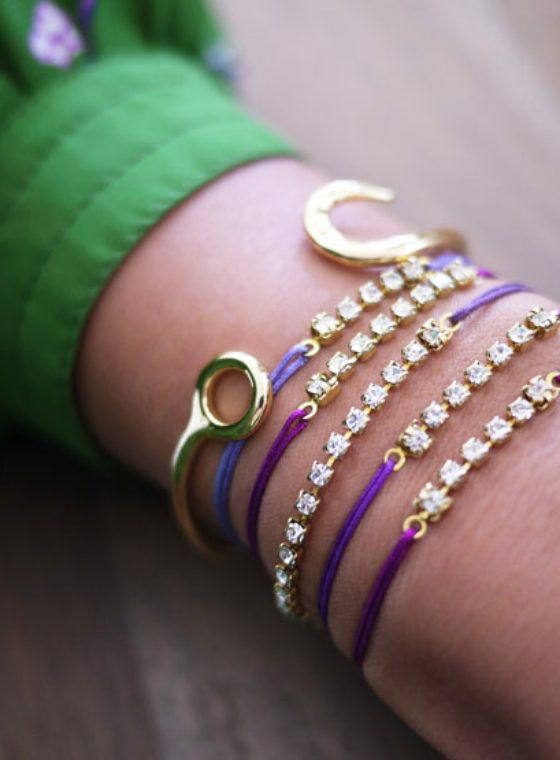 Such a great idea and love the large Odette cuff. Very cool. http://www.thrillofthechaise.com – Enter our new GIVEAWAY! gorgeous bracelet and thanks for the sliding knot technique! Bonjour, génial et très beau ! J’ai 1 “mauvais oeil” mais, avec 1 attache (grr….!!). Je vais trouver 1 système pour contourner la difficulté, maintenant que …je suis “protégée”. Je ne ris pas. Hyper superstitieuse ! De plus, ce qui est beau PROTEGE. Thanks for this, I’ve been wanting one of these bracelets. I love the result, it turned out really great! Love this DIY. I’ll definitely be trying this one out. 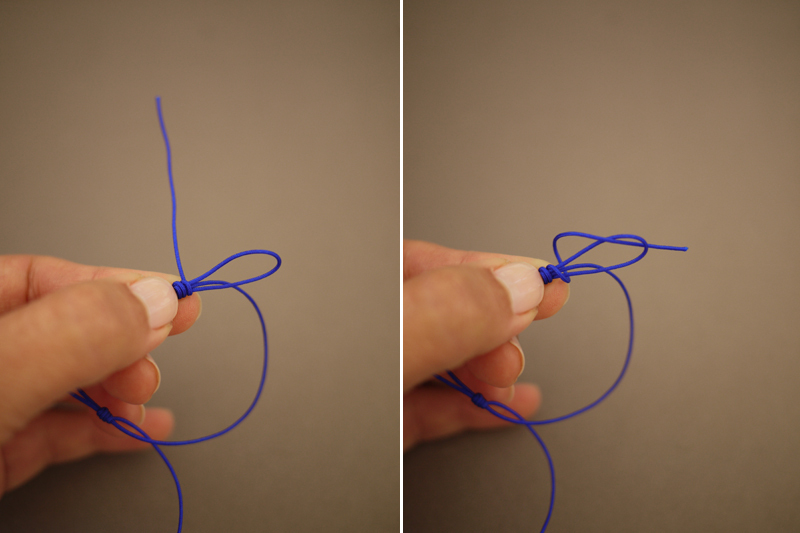 So that’s how you make a sliding knot bracelet! Awesome!!! Always great & simple ideas!!! I’ve seen a lot of these lately but this one looks pretty easy. Although those charms look a little pricey. Know where I can get anything a little cheaper? So fun! Easy to do et verry verry nice colours!!!! – Im from turkey and those bracelets are so popular there right know, great tutorial ! I think they look amazing! As a single piece I wouldn’t wear it instantly but when I see how you stacked them up it looks really cool Loving the blue. As always, one amazing DIY project! Loving the evil eye element. Simple yet powerful! These are really cool, I haven’t tried to make a sliding knot… I think it intimidates me. 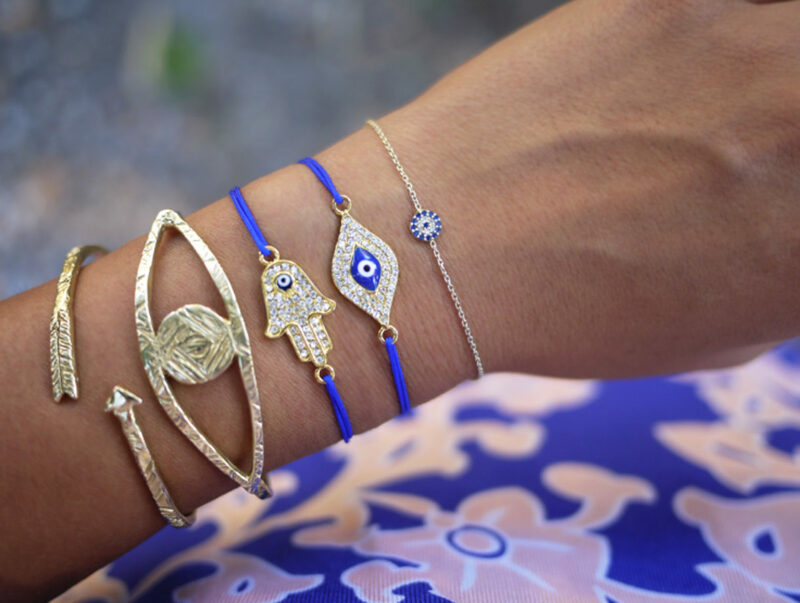 but i would love to try this, the hamsa charm is really pretty! I needed this tutorial 😀 thanks. So cute! Love. Must try. Love this!!! Will have to make one!! wow…… this is SO amazing…. the colors, the design, everything. love them…and mixed with royal blue look cool!! Am putting together a bag for a trip to Cyprus and was pondering accessories. Your blog just made my day and I am so eager to make these. Fabulous. Thanks! i love this DIY! 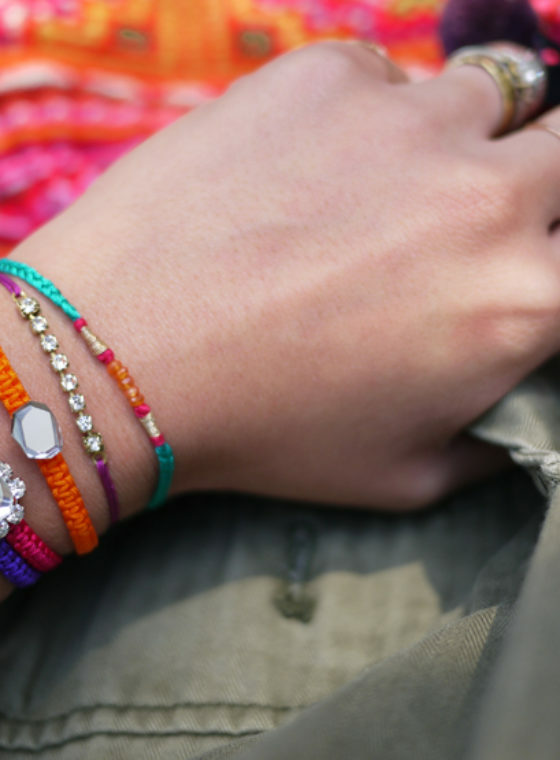 such cute bracelets and i love the charm! I saw a lot of them when I went to turkey last year! I have these little charms hidden in amongst things in each room of my house! I love the bracelets, I may have to use a few of my charms to make something pretty. we have a lot of hamsa jewllery here in israel. I love simple and beautiful things like these brazalets. congrats!! Great post and even better tutorial!! How awesome! A couple of my sliding knot bracelets have broken and now, I can fix them! i’ve just bought a couple of these! Oh wow, what a beautiful bracelet! Thank you so much for all these tutorials! my sister and i went to turkey last month and bought bracelets just like this! hers just broke, so this would be the perfect fix. awww this is so so pretty! 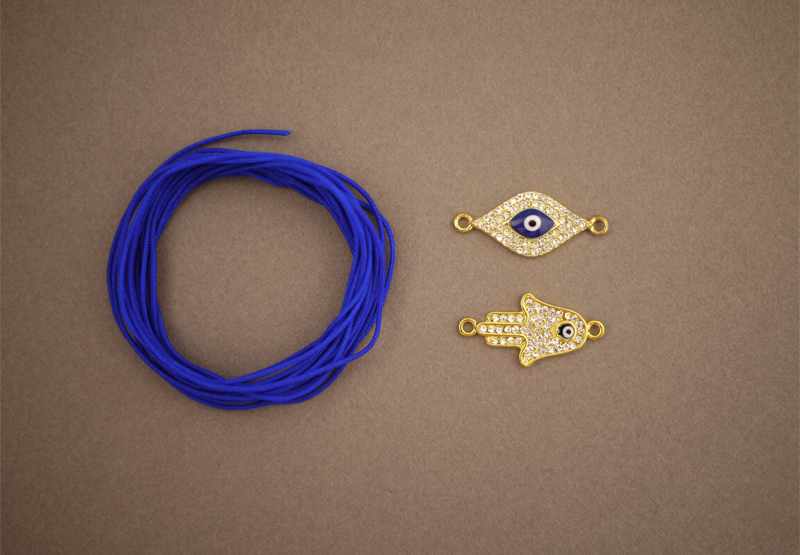 Aaron Basha has the best evil eye collection. They released it in 2008 and other followed suit. All 18K gold. I’ve been wearing mine for 3 years now, shower and all, still looks amazing! Just want them now…not now…NOW!!!!! !Great job…!!! Love this! I bought everything from your resource and the materials have already arrived. Great service! I love this, it so simple!!! Great post. Royal blue looks so good!! We love the evil eye in Greece. Yeah I got the knot but how can you tighten the bracelet when you have it on your wrist? This seems to require another set of hands. Help??? just for some info this is not pronounced “Hamsa” it is pronounced “Khamsa” with a K. Khamsa means the number five which some say, represents the five pillars of islam which are: 1.the testimony of faith 2.prayer 3.giving zakat (support of the needy) 4.fasting during the month of Ramadan 5.the pilgrimage to Makkah once in a lifetime for those who are able. Khamsa is also called “hand of Fatima”, so named to commemorate Muhammad’s daughter Fatima azzahraa. I’m Turkish, i hope this evil eye protects you from evil-minded people. And i don’t know why but 🙂 i felt so happy when i heard that you’ve been in Turkey. I hope you enjoyed. Just made this bracelets love them!!!! Thank you…. Love the blue fabric! The 2 bracelets are awesome. You have always beautiful ideas. Hello.. How long should one thread be for one bracelet? i was just wondering if you have a website where i can purchase some of those macrame bracelets. Oh my god i love this arm party!!! i would like to buy them all. Being Greek, I’m very familiar with the “evil eye”. I can’t wait to try making this. Does anyone know where I can buy those charms (or similar) on the internet? Thank you! Does anyone know where I can get similar beads in London? Which size of the cording – .8 or 1.2? I just got the .8 and seems a bit thin?? @Lori, I used .8mm cording in the tutorial. Wow, these look amazing. It’s great to show people that can make the expensive jewelry today! The pictures are very helpful! Keep it up! super simple and so fun! love your tutorials! It’s also called a hangman’s knot, if anyone knows that term instead. We used it a lot in theatre productions for sets because it does slide. That’s neat! 🙂 Very simple and would make for a good project for the little ones. 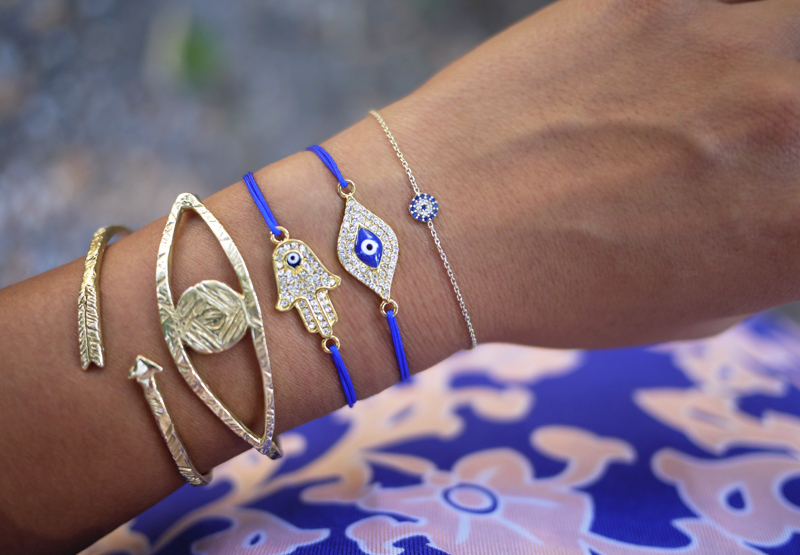 I can’t seem to find a good place to buy the Hamsa/Evil eye. $9 a piece is a bit much if you want to make a bunch of these 🙂 any recommendations? Love the bracelets!! Have you ordered the knotting cord and the charms of that website? Is it a reliable website? Please email me back i need to know cuz im planning to order some for myself! The bracelets are so gorgeous. Thanks for sharing your ideas for making these bracelets. You tips are very simple to understand. 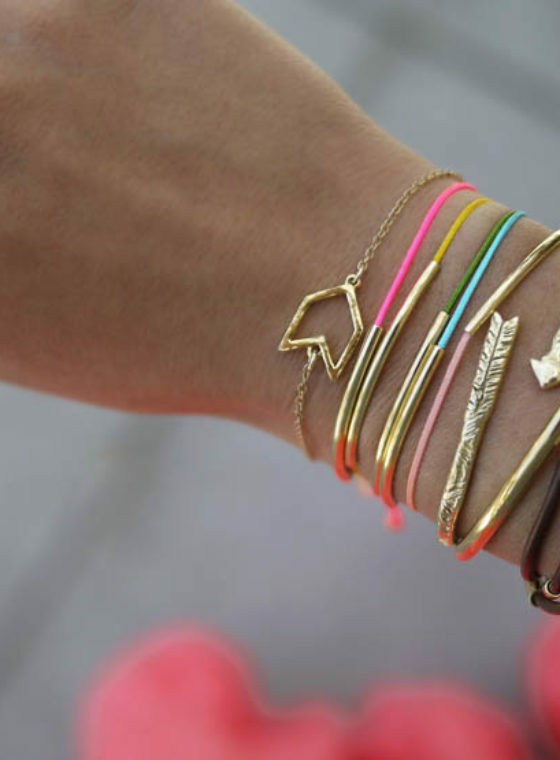 Dying to know where that arrow cuff bracelet came from. So cute! I love your DIY’s but maybe you could post little videos? There are some nice evil eye pieces at http://designerjewelrysavings.com/ . Hi- I love this so much! Where did you find the charm? I love this simple idea. These people used your pics – http://www.aliexpress.com/item/Free-shipping-diy-sliding-knot-bracelet-evil-eye-symbol-and-hamsa-charm-turkey-bracelet-can-protect/1292963357.html? I pretty much get everything from Etsy, it’s the perfect place to buy and sell all things DIY and handmade… Thanks for the awesome site!!! Why would you wear the evil eye and the Hamsa at the same time though? Why would you wear the evil eye at all? Stop appropriating religions it’s disgusting and it makes you look like an idiot. Wow those DIY bracelets look really good! 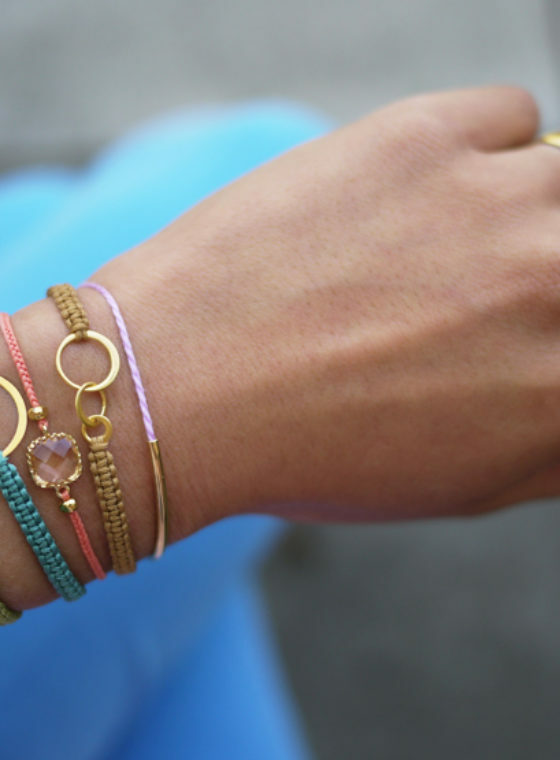 your bracelet DIYs are SO beautiful! I am going to try this one!!!! hi, just passing by to your site. Can you give inspiration with paper or carton board for next idea of DIY? Great post 🙂 very well explained as well. These look so gorgeous. I would love to do this DIY. can you tell me what kind of thread you use please?? Thanks for such a relevant blog… this is a great blog, which provide the relevent info. I love how dainty these look! 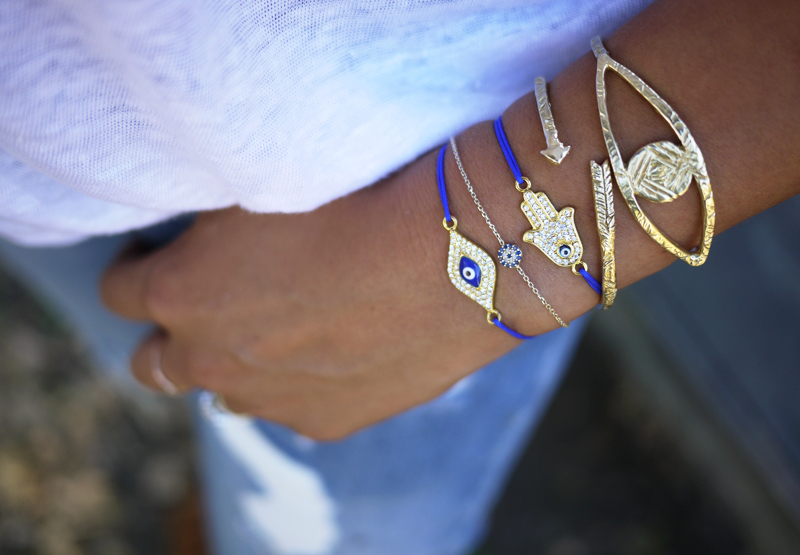 I think I’ll substitute the evil eye charms for something more boho!